Posted on November 16, 2011 at 1:00 pm. 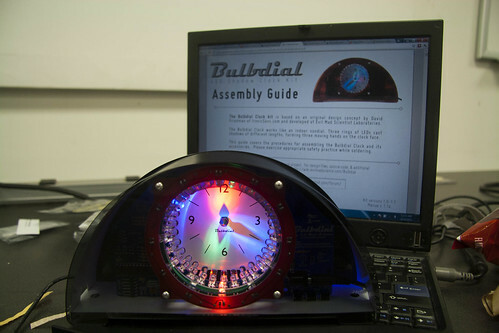 I recently built a Bulbdial clock from Evil Mad Science. It was a blast to put together. EMS puts so much thought into the process of building a kit, not just the end result. The kit consists mainly of three different PCBs that hold each of the different colored LEDs at different heights away from the back clock face. This creates shadow casts of differing lengths, giving the hands of the clock. While constructing the kit it is very important that you get the LEDs consistently aligned on each board. Instead of asking you to insert, align, hold in place and solder all 72 of them individually, they used the PCBs themselves to make a handy jig. As shown above you insert all of the LEDs for the ring and then sandwich them in place with another ring. Once you check over that they’re aligned you go around and solder one leg of each LED. Check once more that they all seem to be pointing to center and then solder the remaining leg of the LED. Remove the screws and board holding them down and you’ve got an entire ring of well aligned LEDS without having to worry about taping anything down or something slipping while you’re holding the solder and iron. This detail, and the included jig for bending the LED leads to 90 degrees make this kit something that anyone with a little proficiency with an iron can accomplish. The only part of the build that seemed a little iffy was bending all of the LEDS so that they pointed down at the center spike. When you solder the LEDs in you’re already making sure that they are pointed to the center of the circle. After you get the board in place and wired up you need to make sure they’re pointing down, outside the plane of the board, and straight at the spike on the clock face. It takes a little getting used to but they really do bend just fine. Just mark sure you’re making good solder joints when you put them in. After you get all the LEDs straightened out it’s time to put it into it’s case and voila! An awesome timepiece that you can show off to your friends. I would definitely recommend this kit to anyone who likes clocks and is looking for a good intermediate kit build. It’s very easy to follow the instructions and get it put together right. This post belongs to a category of posts about different projects that i’m building. Some projects are things that i’m creating and some are kits designed by other folks that I’ve purchased and put together. For other project posts see the projects category.